Continuous measurement three-phase network without neutral parameters. Transferring results via RS-485 interface (protocol Modbus RTU), and converting to two unified current outputs. Single-phase network with 50..4000 Hz frequency parameter measuring and converting to digital signal and two unified current outputs. Continuous measurement three-phase network with neutral parameters. transferring results via RS-485 interface (protocol Modbus RTU), and converting to two unified current outputs. Three-phase network without neutral parameters continuous measurement by two wattmeters method. Accuracy class is 0.5. Voltage measuring in single- and three-phased average current circuits. 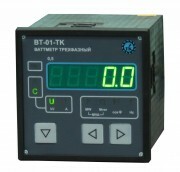 Developed as pointer voltmeters replacement. Accuracy 0.5.